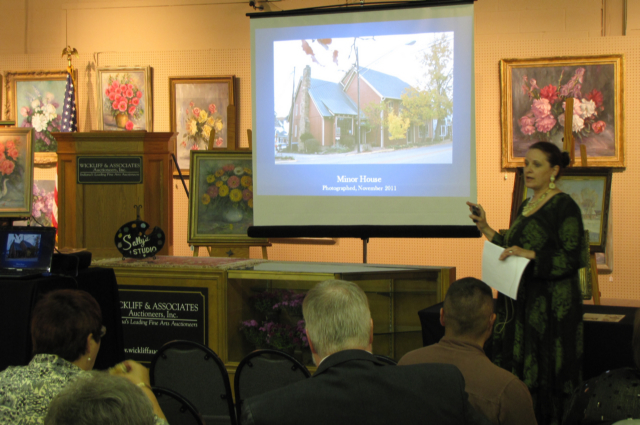 We have mentioned in previous posts that we (Wickliff Auctioneers) were honored to have been selected to conduct the Sally Brant Kriner artist’s estate auction. We remain so honored, and pleased that so many patrons and bidders chose to join us on Thursday for the reception and on Saturday for the auction. Our preview and reception was a joyful event and was attended by many of the Kriner descendants, as well as board members of the Brown County Art Guild and other art patrons, both new and previous clients of ours. All in attendance enjoyed hors d’oeuvres, music of Bill Lancton and a wonderful presentation by Guild Executive Director Jaime Sweany. Additionally, everyone enjoyed a special song by Sue Wickliff, accompanied by Bill, in Sally’s honor. Sue sang the Ella Fitzgerald classic, “They Can’t Take That Away From Me“, much to the delight of the Kriner family, who shared that Sally did, in fact, ‘sing off key’! 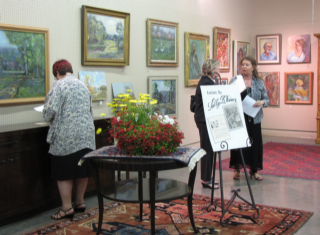 The auction was well-supported by our Wickliff buyer clientele, but also by individuals acquainted with the Guild, and others who knew Sally or had previously purchased paintings from her. Nearly everyone registered stayed for the entire session, including bidding on the uncatalogued collection of books, vintage frames and unfinished paintings. The previous record for a Sally Kriner painting had been achieved two times by two different companies, including ours, at $400. That record was eclipsed many times over, supporting our previous statement that most folks had not seen the quality of paintings that Sally had squirreled away in her studio, many inscribed on the back, ‘keep’, or ‘not for sale’, and many of those were some of her best paintings. The record sale was a $3,100 price achieved for a 32 x 36 canvas depicting lilacs in a vase; lilacs were among Sally’s favorite flowers to paint and she was quite adept at capturing the beauty of those flowers, as well as that of roses and peonies.